Villous atrophy occurs when your intestinal villi —the microscopic, finger-like tentacles that line the wall of your small intestine—erode away, leaving a virtually flat surface. 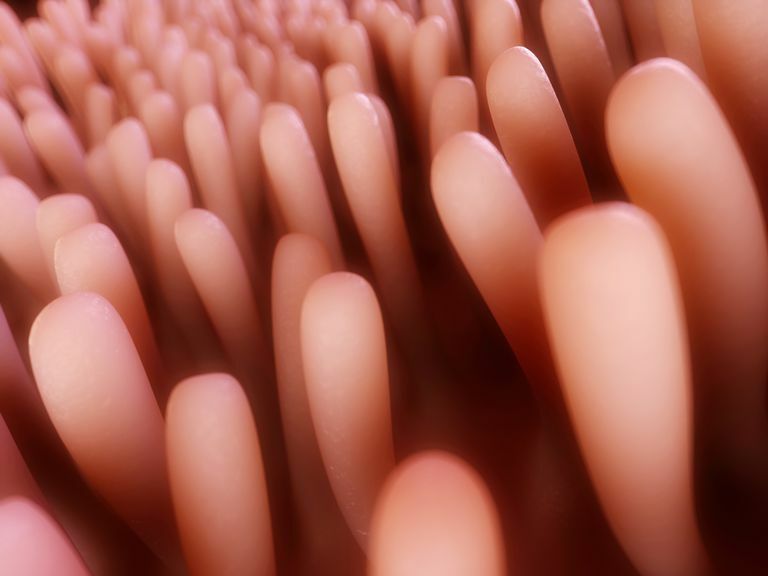 Since your intestinal villi are responsible for absorbing the nutrients contained in the food you eat, losing them to villous atrophy can result in serious nutritional deficiencies. Celiac disease is the best-known cause of villous atrophy. When you have celiac and you eat foods containing the protein gluten (contained in the grains wheat, barley, and rye), the gluten triggers an attack by your immune system on your intestinal villi. This autoimmune disease attack eventually leads to villous atrophy, which doctors rate by Marsh Score, a measure of its severity. In the worst-case scenario with celiac disease, your villi can be completely destroyed — total villous atrophy. That's considered Marsh Score 4, and people with that score are likely to be severely malnourished and may be at risk for lymphoma. The only way to see if you have villous atrophy is to look directly inside your small intestine. Doctors do this with a procedure called an endoscopy, in which they thread a device with a tiny camera and other instruments down your throat, through your stomach, and into your small intestine. It's also possible to swallow a pill containing a camera—this is called capsule endoscopy. You're not guaranteed to have celiac disease just because you have villous atrophy. Several other conditions, plus some medications and even bacterial overgrowth, can destroy your intestinal villi. In many cases, the symptoms of villous atrophy not caused by celiac disease—called "nonceliac enteropathy"—mirror the classic symptoms of celiac disease: diarrhea, weight loss, abdominal pain, and fatigue. Therefore, it can be tricky to tell the difference between celiac disease and nonceliac enteropathy. That's why physicians recommend celiac disease blood testing—those tests look for your immune system's specific reaction to the gluten protein in the foods you're eating. It's still possible to have celiac disease even with negative results on those blood tests, but if you don't start to feel better once you go gluten-free, you and your doctor may need to consider alternative causes for your symptoms and your villous atrophy. Benicar, a blood pressure medication (generic name: olmesartan). In some patients, taking Benicar leads to villous atrophy combined with diarrhea and weight loss. The U.S. Food and Drug Administration issued a warning about this in 2013. Other medications. Drugs that suppress your immune system (such as Imuran and CellCept), the antibiotic neomycin, and the anti-inflammatory medication Colcrys, also have been linked to reports of medication-induced villous atrophy. Common Variable Immune Deficiency, or CVID. This condition leaves people vulnerable to recurrent infections. Small intestine Bacterial Overgrowth, or SIBO. Symptoms of SIBO can mimic those of celiac disease. Crohn's disease. Villous atrophy is unusual in Crohn's disease but does occur occasionally. Lymphoma. One study found two different types of lymphoma could cause villous atrophy: small intestinal T-cell lymphoma, and enteropathy-associated T-cell lymphoma. Enteropathy-associated T-cell lymphoma is closely linked to celiac disease. Other possible causes of villous atrophy, including infection with parasites or with the ulcer-causing bacteria Helicobacter pylori, also have been reported. So the bottom line is, not every case of villous atrophy is caused by celiac disease. If your blood test results are negative and you're not improving on the gluten-free diet, you should talk to your doctor about other possible causes for your symptoms. Pallav K et al. Noncoeliac Enteropathy: The Differential Diagnosis of Villous Atrophy in Contemporary Clinical Practice. Alimentary Pharmacology & Therapeutics. 2012;35(3):380-390. Tran TH et al. Olmesartan and Drug-Induced Enteropathy Pharmacy and Therapeutics. 2014 Jan; 39(1): 47–50.